You can use various combinations of the F8 key to step through code, and also use the yellow arrow and right mouse button to change the next executable statement. As mentioned, you can use the F8 key to step through code, but what happens when you reach a call to another routine? If you step into the GetWords routine as above by pressing F8 and then realise that you didn't mean to do this, you can press - wait for it - SHIFT + CTRL + F8 to execute the rest of the GetWords routine and return the current line to the main CheckAnagrams program. Want to run the GetWords routine again? 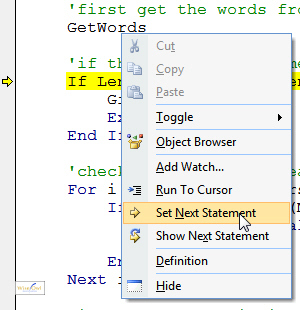 Just drag the yellow arrow to the line which you want to execute next, and Excel will make this the next executable statement. It hardly needs saying, but you should do this with care only! Right-click on any executable line to make this the next statement to be executed (it will go yellow). Once you've got the hang of stepping through macros, it's time to set some breakpoints.